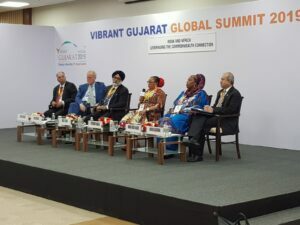 During Vibrant Gujarat 2019, CWEIC partnered with the Confederation of Indian Industry (CII) to host an event on India’s Commonwealth connection to Africa. The event took place during India-Africa Day at the summit, which celebrated the ever-strengthening relationship India has with the African continent. CWEIC Chair Lord Marland was joined by Strategic Partners from Nigeria and Uganda, as well as representatives from the Confederation of Indian Industry (CII), to talk about greater trade and collaboration between India and Africa. Mrs Folorunso Alakija, Vice Chair, Famfa Oil Limited (Nigeria) and Dr Amina Hersi Moghe, Chief Executive Officer, Horyal Investment Holding Company (Uganda) set out ambitions for their companies to increase trade with India. India continues to be Nigeria’s largest purchaser of crude oil. Famfa Oil is one of Nigeria’s biggest crude oil exporters, and is committed to developing one of the deepest and largest offshore discoveries in the gulf. Horyal Investments is a Ugandan business which largely focuses on infrastructure in North Uganda, most recently investing in the region’s first sugar factory.